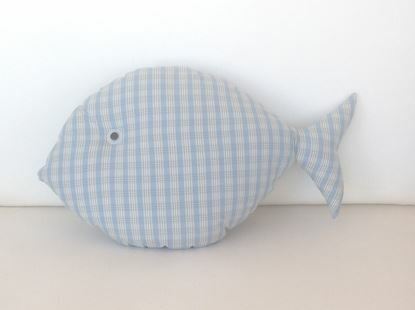 Mediterranean style fish shape, throw pillow for our little treasures blue ocean dreamers!! So comfortable and soft perfect for hugs, support and placing to your couch. An adorable pillow for kids room, playroom, bedroom, sofa, and even for outdoor decoration. Made entirely by hand thus, each one is slightly unique, making them extra special for yours specials!!! Perfect for any age. Material: Cotton. Composition: 100% Cotton. Filling: 100% Polyester. Hand wash. Pillow measures about L 65cm x W 45cm x H 15cm Your baby's safety is our top priority. Please don't leave your infant unattended with these pillows. These are for decoration only! Our products are made by hand in beautiful Thessaloniki, Greece. Thank you for supporting handmade. 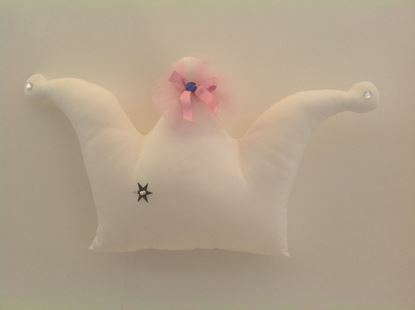 Add a royal touch to your little prince or princess baby's nursery or child's bedroom with this lovely Crown cushion. Made entirely by hand thus, each one is slightly unique, making them extra special for yours specials!!! Perfect for any age. Material: Cotton. Composition: 100% Cotton. Filling: 100% Polyester. Hand wash. Cushion measures about L 50cm x W 30cm x H 70cm Your baby's safety is our top priority. Please don't leave your infant unattended with these pillows. These are for decoration only! Our products are made by hand in beautiful Thessaloniki, Greece. Thank you for supporting handmade. 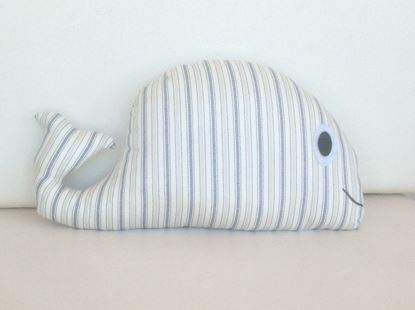 Huggable Whale-shape pillow a fun and imaginative character that you can use to make a beautiful addition to any child’s room or nursery! Perfect to give as a baby shower gift or cute keepsake! So comfortable for play, support and placing to your sofa. An adorable pillow for kids room, playroom, bedroom, sofa, and even for outdoor decoration.Made entirely by hand thus, each one is slightly unique, making them extra special for yours specials!!! Perfect for any age. Material: Cotton. Composition: 100% Cotton. Filling: 100% Polyester. Hand wash. Pillow measures about L 60cm x W 35cm x H 10cm Your baby's safety is our top priority. Please don't leave your infant unattended with these pillows. These are for decoration only! Our products are made by hand in beautiful Thessaloniki, Greece. Thank you for supporting handmade. 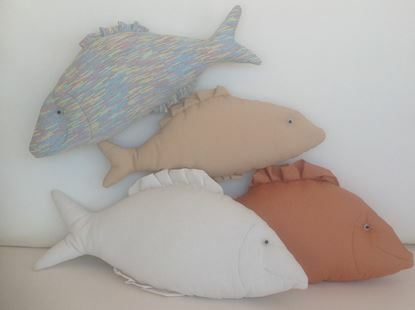 Add a nautical touch to your little treasures one's room with these enchanting Fish set cushions. They are softly padded and double sided. A must have pillows set for ocean dreamers as is created to help calm the young ones to sleep. Comfortable and soft perfect for hugs, support and placing to your couch. Made entirely by hand thus, each one is slightly unique, making them extra special for yours specials!!! Perfect for any age. Material: Cotton. Composition: 100% Cotton. Filling: 100% Polyester. Hand wash. Pillow set measures about L 55cm x W 30cm x H80cm Your baby's safety is our top priority. Please don't leave your infant unattended with these pillows. These are for decoration only! Our products are made by hand in beautiful Thessaloniki, Greece. Thank you for supporting handmade. Cute as ever with a lovely red bow our best seller Kitty cushion. Sweaty, soft, cuddly cosy pillow. 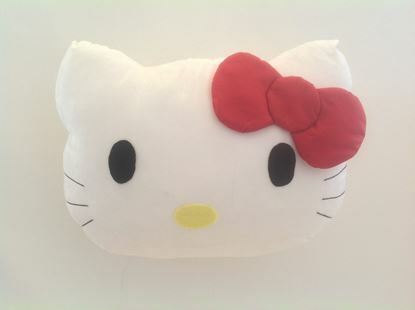 Perfect for playing, kids to rest their heads during a road trip in the car, give away as a gift to Hello Kitty lovers, and definitely the most stunning cushion for baby and teens girls’ room. Made entirely by hand thus, each one is slightly unique, making them extra special for yours specials!!! Perfect for any age. Material: Cotton. Composition: 100% Cotton. Filling: 100% Polyester. Hand wash. Pillow measures about L 50cm x W 40cm x H 10cm Your baby's safety is our top priority. Please don't leave your infant unattended with these pillows. These are for decoration only! Our products are made by hand in beautiful Thessaloniki, Greece. Thank you for supporting handmade. Seashell pillow is an ideal complement to your girls mermaid's room or to your boys nautical room or even your teens and adults sea lovers. 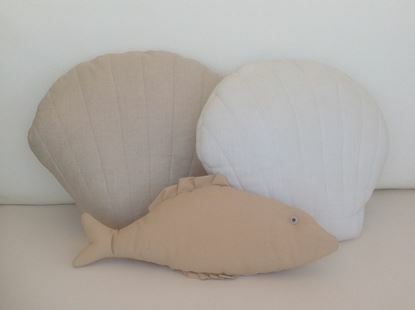 A huggably-soft seashell shape design cushion its a play toy, support and decoration element for any exotic nautical style funs. 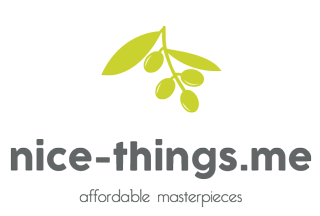 Great adds on for room, playroom, bedroom, sofa, and even for outdoor decoration. Made entirely by hand thus, each one is slightly unique, making them extra special for yours specials!!! Perfect for any age. Material: Cotton. Composition: 100% Cotton. Filling: 100% Polyester. Hand wash. Pillow measures about W 50cm x H 45cm x H 10cm Your baby's safety is our top priority. Please don't leave your infant unattended with these pillows. These are for decoration only! Our products are made by hand in beautiful Thessaloniki, Greece. Thank you for supporting handmade.